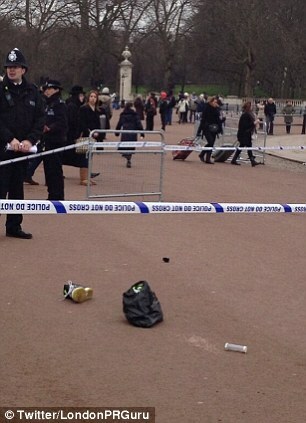 London Police Subdue Suicidal Man Wielding Knives in front of Buckingham Palace. 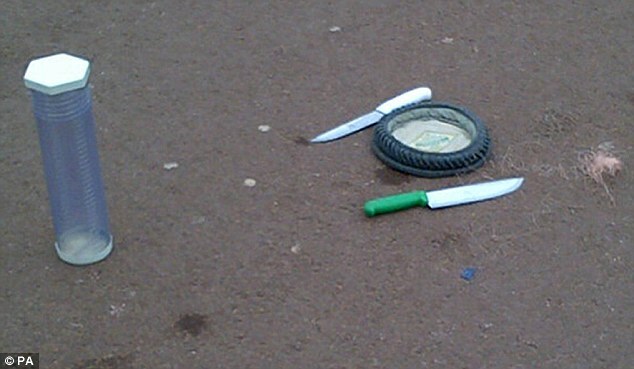 No One Injured. 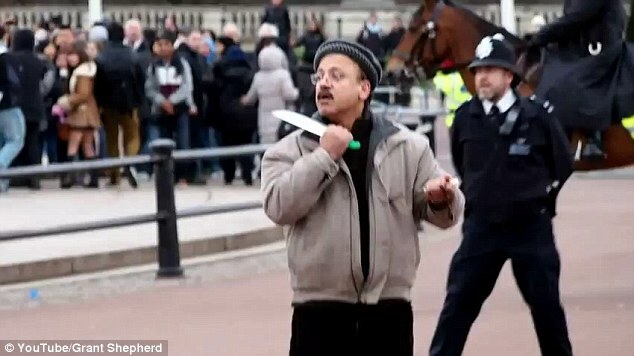 Holding a blade to his own throat, this was the moment a knifeman brought chaos to the Changing of the Guard ceremony at Buckingham Palace yesterday. 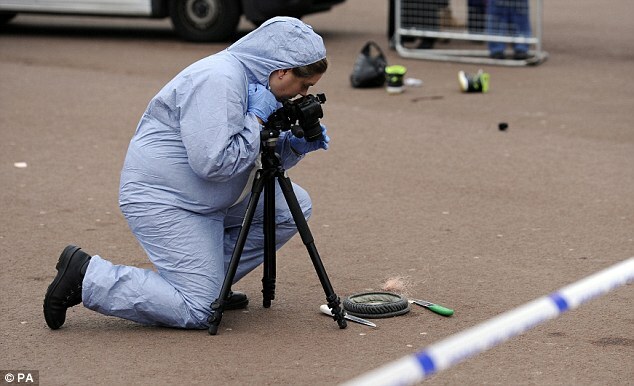 Talhat Rehman, 54, of Harrow, has been charged with possessing a bladed weapon in public and affray, and will appear at Westminster Magistrates Court today. 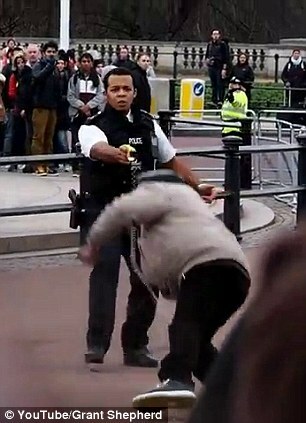 The middle-aged man walked through crowds of tourists clutching two large kitchen knives before police surrounded him and used a Taser stun gun to disarm him. 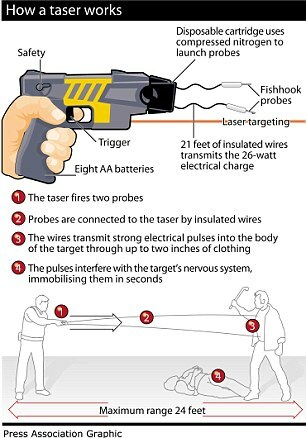 As a policeman shouted a warning call of ‘Taser, Taser, Taser’ to his colleagues, the knifeman allegedly lunged forward, brandishing a six-inch blade in a series of swipes, before falling to the floor as he was stunned by the electrical charge. 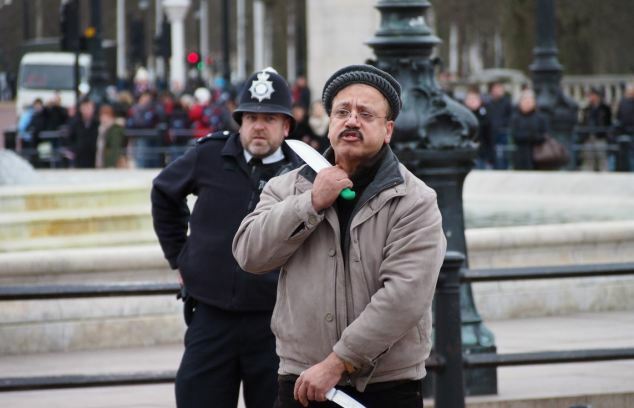 A video showed Mr Rehman shouting and holding the knife to his throat as he walked past the Victoria Memorial, towards the gates of the palace. 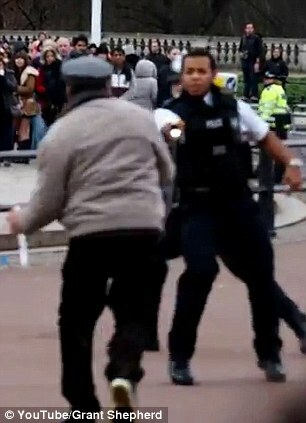 Police officers shouted to tourists to keep away from the man as they raced to surround him. 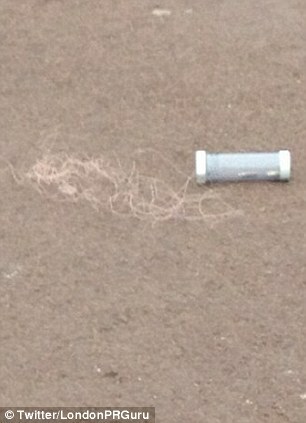 The Harrow man, who clutched a set of wooden beads and wore a flat woollen hat similar to the pakuls traditionally worn by men in parts of Pakistan and Afghanistan, was later arrested. 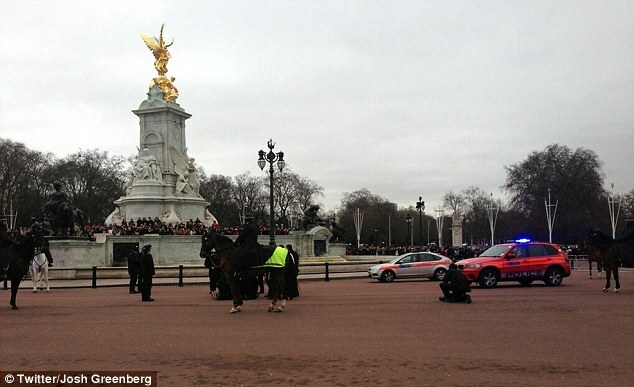 The drama unfolded as crowds gathered outside the palace before the midday Changing of the Guard ceremony, one of London’s most popular tourist attractions. 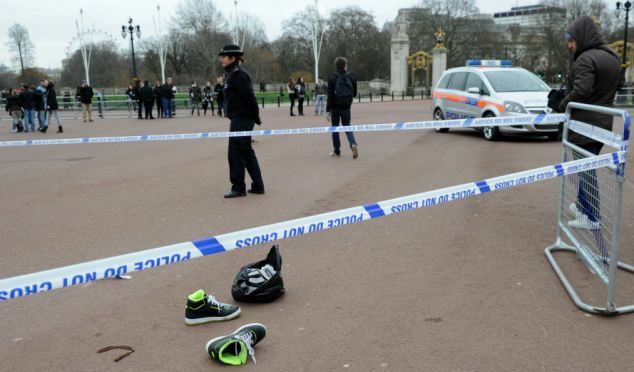 Witnesses described seeing the bespectacled man breaking through a barrier and walking towards the palace before he was stopped and surrounded by police. 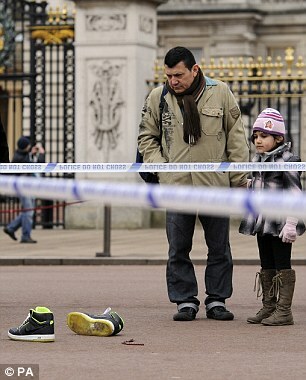 Eyewitness Kevin Burrows, 33, said: ‘He had a knife in each hand. 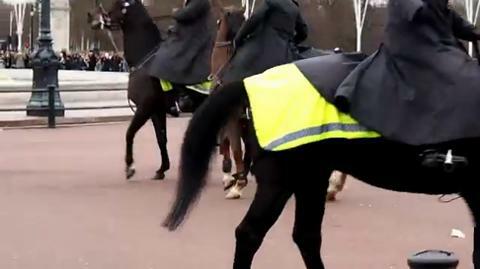 ‘The police were on him in seconds, he didn’t have a chance of getting close to anyone. The Queen and the Duke of Edinburgh were at Sandringham but were understood to have been informed about the drama. 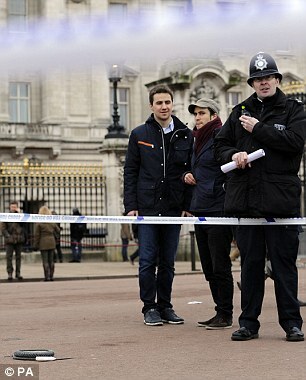 Scotland Yard is responsible for security at the palace and armed officers maintain a round-the-clock presence there, even when members of the Royal Family are not in residence. 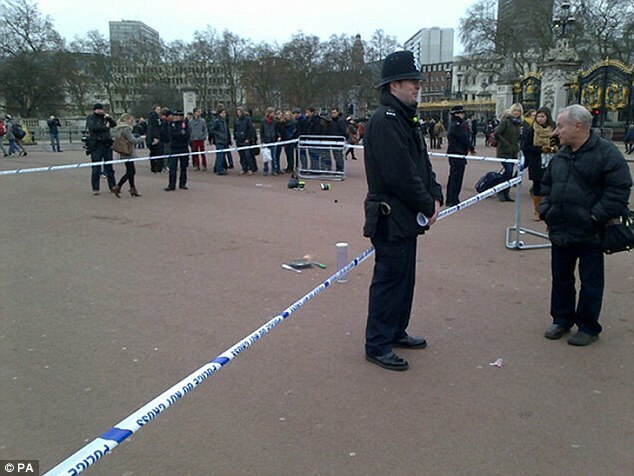 Police cordoned off the area where the Taser was fired, some 30 yards from the palace gates. 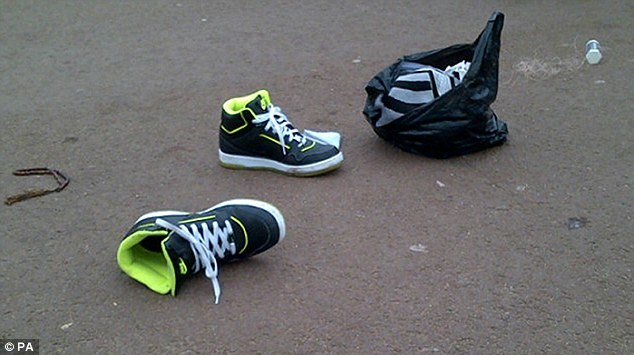 The man, who has not been named, was checked by medics and arrested on suspicion of affray. 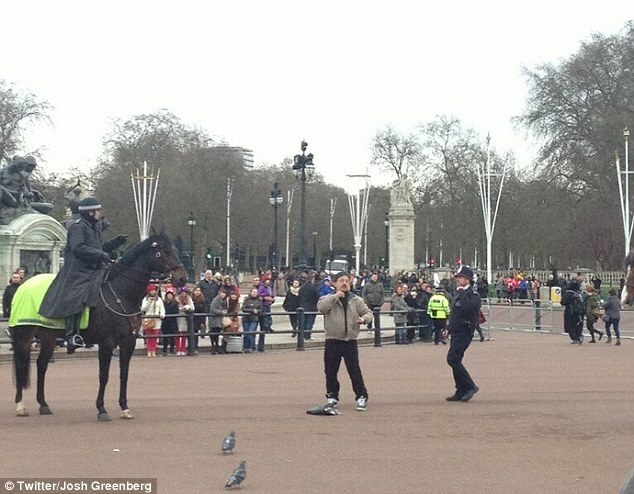 Shocked tourists said police told them the man could have ‘mental health issues’. 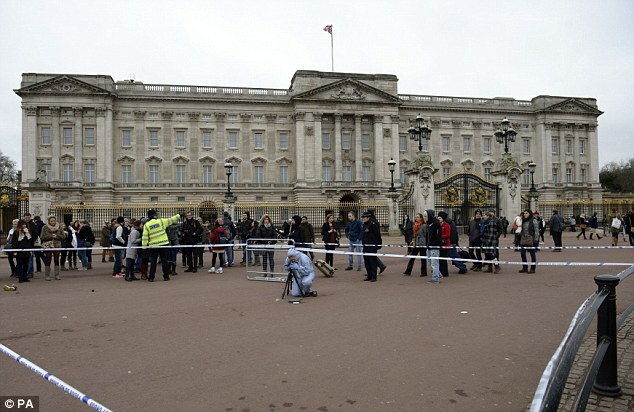 In June 1982 an intruder armed with a knife managed to get on to the palace forecourt before he was stopped. A month later Michael Fagan got inside the Queen’s private chambers while the monarch was still in bed. ← Maryland Police Kill Suicidal Man Wielding Knife.